The Wool-carder Bee, Anthidium manicatum, is one of the largest British solitary bees. Both sexes are similarly marked with a pattern of yellowish markings along the side of the abdomen, head and legs. The female collects pollen on the underside of the abdomen in a stiff brush of rearward pointing hairs which makes her an excellent pollinator of a range of garden and wild flowers. The Wool-carder Bee has a single generation each year, and flies in the summer months of June, July and August. Unusually among British bees, the male is considerably larger than the female. 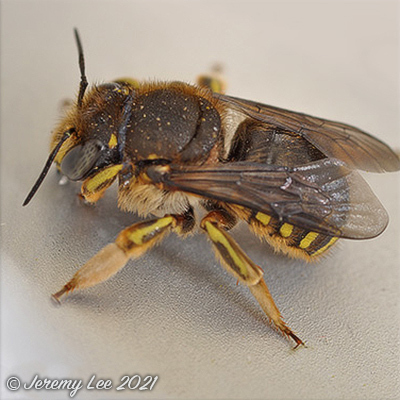 He is fiercely territorial, defending his territory vigorously against intruding male Anthidium and other insects (eg Honeybees) and will fly directly and rapidly at invaders to move them on. The male backs up his aggression with threat as the tip of his abdomen is armed with a series of stout spines. It is a regular visitor to flower-rich habitats such as coastal undercliffs and dunes, calcareous grasslands and roadside verges, along with gardens and parks in towns and villages over much of England and Wales. The females collect pollen from a number of species of plant, favouring those which have tubular flowers (such as Mint family) or restricted access to pollen and nectar (Pea family, Toadflax family). Nests are constructed in existing aerial cavities, such as beetle holes in dead wood in addition to artificial sites such as cut bamboo canes. The species gains its English name from the bees’ behaviour of shaving hairs off plant stems to use in the construction of brood cells. In a few places, it is the host of the uncommon parasitic bee Stelis punctulatissima.